Brook + Wilde luxury mattress, designed for your sleep. 3 comfort choices, soft, medium, firm. Premium delivery, 100 Night Comfort Trial, 10 year guarantee. Follow Brook + Wilde to get news updates and products on your homepage. Brook + Wilde is being followed by 0 people. Brook + Wilde is currently ranked 979 in the directory. Last month its rank was 1764. 5 products added to Brook + Wilde 4 days ago. 1 products added to Brook + Wilde 8 days ago. 1 products added to Brook + Wilde 11 days ago. 1 products added to Brook + Wilde 14 days ago. 13 products added to Brook + Wilde 21 days ago. 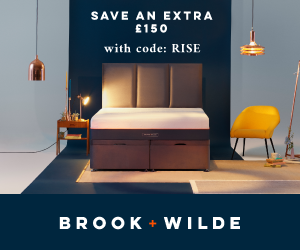 A Special Offer was added for Brook + Wilde: Spend £499.00 Get Extra £100 Off with Code SPRING Plus 25% Off Site Offer 29 days ago. 5 products added to Brook + Wilde 33 days ago. A Special Offer was added for Brook + Wilde: Spend £599.00 or more on the Brook Plus Wilde website between Tuesday 5th and midnight Monday 18th March 2019 and get 25% off with code CLOVER Plus free pillows! 41 days ago. A Special Offer was added for Brook + Wilde: Spend £599.00 or more on the Brook Plus Wilde website between Tuesday 5th and midnight Monday 18th March 2019 and get 25% off with code CLOVER Plus free pillows 49 days ago. 70 products added to Brook + Wilde 50 days ago.